The Bellarine Peninsula house is situated at the picturesque Waters Edge Terrace on Victoria’s Bellarine Peninsula, and was constructed by local builders Daran Constructions. 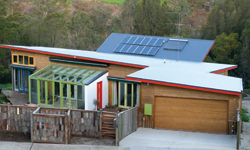 The home as been deemed by HIA GreenSmart to be Australia ’s most sustainable. The home as a six-star energy rating and is on a sloping site with river views. One of the major goals for the performance of the house was to maximise the views while ensuring heat loss from glazing was minimised. Thermal mass is provided by a 50mm screed slab for the main living area of the home. The roof was designed by the architects with appropriate pitch for rainwater collection and to channel it into one area, rather than have multiple downpipes. The owner has reported very good comfort, particularly in the winter, and much better heat retention. In summer, the passive solar design keeps the house cool – air conditioning is not used, only fans. 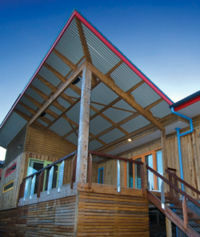 The house won the 2008 Master Builders Assocation Excellence in Housing Award for he Best Sustainable Energy Home category. This page was last modified 02:03, 19 November 2008.